Okay, I’ll tell you: GANFYD stands for: „Get A Note From Your Doctor!“. Actually this phrase is frequently used by all sorts of bank- or insurance managers, employers, line managers, businesspeople or bureaucrats of any type. They use this phrase to fob off those people who want money off them. Before you get one single cent (or penny) out of me, get a note from your doctor first or go away for ever – in the hope that some customers may chose the latter. Unfortunately most disapointed customers chose to turn up at their doctor’s who then are faced with an unhappy and demanding patient. Sometimes the demand can not be met – which is probably exactly what the bureaucrats had in mind. But rather than being rude and firmly say „No!“ to their customers they shift this burden off to the medical profession. Usually it hits the poor General Practitioners. We hospital doctors are only very occasionally asked for a GANFYD. „There is someone waiting for you!“ said nurse Betty. Seconds later I was facing a slightly overweight lady in her mid-fifties and her husband. „It is about my mother!“ she said. What the f… is this? Do I remember all patients who might or might not have been here six months ago? Do they really ask me to look up piles of old medical records to check….? How much is half an hour of my time worth? Sure it is not more than the taxi fare from hospital to wherever Mrs. Mum lives? Thankfully we do have a very skillful secretary. I must admit, on hospital-headed paper, with signature and stamp it looked really official. Okay, here we are. Let me start with the basics. This big thing, right in the middle of it, this is Germany! There are quite number of us, must be around about 80 millions these days, which is probably more people than there are bath towels in Mallorca. So now you know. We are a bunch of strong, serious and no-nonsense people. We work hard, we build nice cars, there is no speed limit on our autobahn and we usually win the football world cup (No, it wasn’t a goal in 1966!). We are straight and straight forward. If anything is kaputt we will fix it. If anything is verboten, we won’t touch it. No, we do not have the slightest sense of humour. But we do enjoy moaning! We enjoy moaning even more than we enjoy Mülltrennung and Kurtaxe and Kehrwoche. If you haven’t heard about those three things you know nothing about Germany. But don’t worry: I’ll explain… that is what this blog is going to be about! We not only like to moan, but also to critisize, to argue and to discuss anything and everything. With one exception: Don’t ever mention the war! That is… unless your name happens to be John Cleese . In fact John Cleese did mention the war more than once and… sort of… got away with it, as we know. To tell you the truth: we not only enjoy mentioning the war which we do quite frequently, we also enjoy discussing and analyzing any aspect of ist… although we are not nearly as obsessed about it as the English. We are definitely not obsessed with any Nazi stuff any more, in fact, we are quite annoyed about this. At least most of us are. There is no „th“ in our language. Well, not if you mean that lisping sound… but we do have a health service in our country. Our health service is not yet as expensive to run as the thing they do in the United States of America and the standards are definitely higher than in the Peoples Republic of Congo. To be honest, our health service ia actually not too bad. Especially not if you are into Natural Remedies, Homeopathy, Aura- or Crystal Healing and this type of stuff. There is also lots of free spa treatment on offer in the public German health service, funded by your insurance contributions. You may not know, but in fact German style spa treatment is so famous, that the term „Kurort“ – meaning spa resort town – has actually made it into the Russian language. See, it’s all good for something, eh? Anyway, watch this space! See you soon! 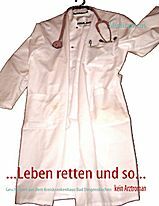 Actually we are here for more than four years already… more or less… but if you weren’t able to read German… tough luck! ….today is the first day of…. …you can’t pronounce that, he? …so I guess you may sort of have got the idea of it? 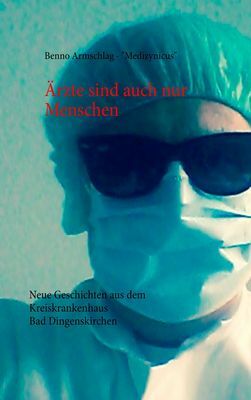 Medizynicus is a Medical Doctor, working in a hospital, somewhere in Germany, writing about his day to day life in small-town Germany, busy saving lives and catering for the medical needs of his bustling community.